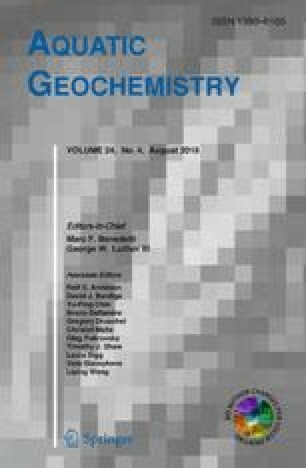 In order to assess the potential risk of metal release from deep-sea sediments in response to pH decrease in seawater, the mobility of elements from ferromanganese (Fe–Mn) nodules and pelagic clays was examined. Two geochemical reference samples (JMn-1 and JMS-2) were reacted with the pH-controlled artificial seawater (ASW) using a CO2-induced pH regulation system. Our experiments demonstrated that deep-sea sediments have weak buffer capacities by acid–base dissociation of surface hydroxyl groups on metal oxides/oxyhydroxides and silicate minerals. Element concentrations in the ASW were mainly controlled by elemental speciation in the solid phase and sorption–desorption reaction between the charged solid surface and ion species in the ASW. These results indicated that the release of heavy metals such as Mn, Cu, Zn and Cd should be taken into consideration when assessing the influence of ocean acidification on deep-sea environment. We thank the anonymous reviewers for constructive and valuable comments and the editor for the editorial handling of the manuscript. We thank Toshihiro Yoshimura of JAMSTEC (Japan Agency for Marine-Earth Science and Technology) and Yuki Ota of the Atmosphere and Ocean Research Institute, the University of Tokyo for their assistance on ICP-MS measurement. This research was supported by Grants-in-Aids from the Japan Society for the Promotion of Science to H.K. (Nos. 19340146, 22224009 and 15H02139). All authors contributed to the design of the experimental strategy. Q.W. and A.S. conducted the experiment and ICP-MS measurements. Q.W. completed the data processing and wrote the manuscript. All authors contributed to revise the manuscript.